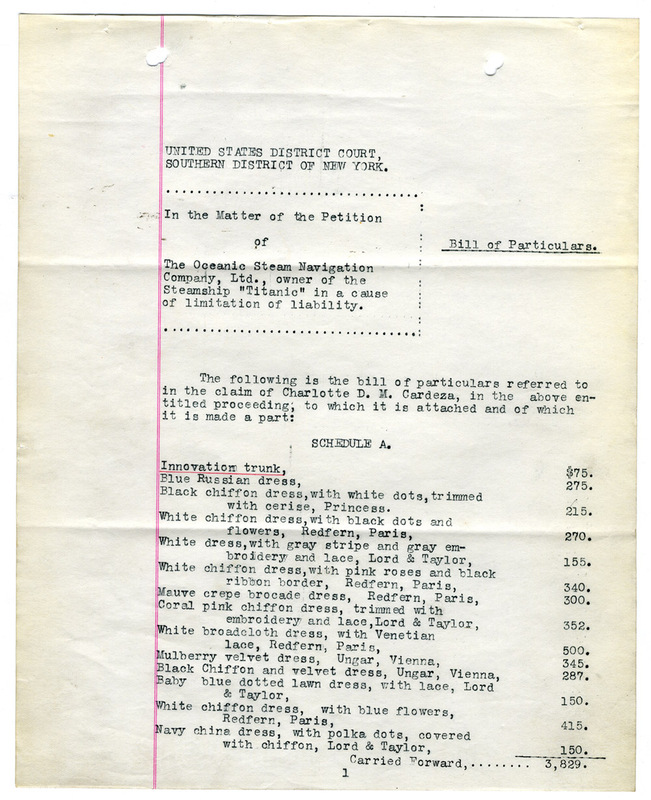 1,100 pages of admiralty case files from the U.S. District Court for the Southern District of New York, related to the RMS Titanic, including the petition filed by the Oceanic Steam Navigation Company, as the owner of Titanic, for limitation of liability, and responses from claimants, copied from material held at the National Archives and Records Administration. 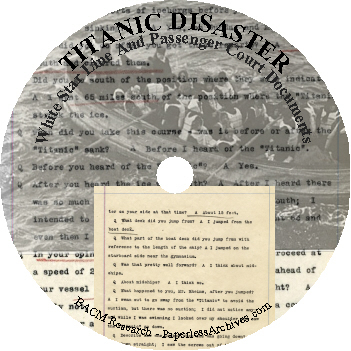 The case of "In the Matter of the Petition of the Oceanic Steam Ship Company, Limited, for Limitation of its Liability as owner of the steamship TITANIC," was filed in accordance with the liability laws in place at the time of the Titanic Disaster, allowing the owners of the White Star Line to seek to have the courts limit their liability. The case file contains court papers, evidence, depositions from surviving passengers and claims of survivors and representatives of deceased passengers. Some documents tell in the first person the story of the sinking in dramatic detail. In the petition, the White Star Line claimed that the collision was due to an "inevitable accident." The Titanic's liability was governed by the 1851 "Act to limit the Liability of Ship-Owners, and for other Purposes." This law was designed to encourage shipbuilding and trade by minimizing the risk to owners when disasters occurred at sea. The Act prevented maritime companies from having liability for any loss of life, property, or injury, in cases of unavoidable accidents. When it could be proved that the captain and crew made an error that led to loss, but the ship's owners were not aware of it, the company's liability was limited to the total of passenger fares, the amount paid for cargo, and any salvaged materials recovered from the wreck. The 712 survivors and the families of the 1,517 dead therefore might be entitled to only a total of $91,805: $85,212 for passengers, $2,073 for cargo, and a $4,520 assessment for the only materials salvaged from the Titanic, the recovered lifeboats. Those claiming damage would have to prove that the owners of the Titanic were aware of the factors that caused the Titanic's losses to get a higher amount. The law would squash the statutory limits on the company's liability, if the claimants could prove not only that the captain and crew were negligent, but that it was also true that Titanic's owners had knowledge of this fact. White Star filed its petition; this was followed with the placing of notices in the New York Times between October 1912 and January 1913, to inform those who had claims for damages to provide proof by April 15, 1913. The result was hundreds of claims from around the world, totaling $16,604,731. Claims were divided into four groups: Schedule A: Loss of Life, Schedule B: Loss of Property, Schedule C: Loss of Life and Property, and Schedule D: Injury and Property. This collection contains several dozen claims filled in the case. Survivors of the Titanic Disaster were not necessary free from physical harm. Examples of claims found in the documents: Anna McGowan of Chicago, Illinois, missed getting onto a lifeboat before they were lowered, forcing her to jump from the Titanic and into a lifeboat. Her claim states that she sustained permanent injuries from the fall, shock, and frostbite. According to her filing, the experience left her in a state of "nervous prostration" and unable to provide for herself. Patrick O'Keefe of Ireland also jumped overboard to save his life, but he remained in the cold Atlantic waters in a collapsible raft for hours before being rescued by lifeboat B.
Bertha Noon of Providence, Rhode Island, filed a claim requesting $25,000 in compensation for injuries she sustained after being pushed onto a lifeboat and being exposed to the cold for several hours before being rescued by the Carpathia. Her enumerated damages include an injured back and spine that left her "unable to wear corsets," severe nervous shock, a "misplaced womb," and a recurring congestion in her head and chest that left her delirious and unconscious for days at a time. Among the claims for loss of property, Margaret "Molly" Brown's three crates of ancient models destined for the Denver Museum, Col. Archibald Gracie's documents concerning the War of 1812, and over 110,000 feet of motion picture film owned by William Harbeck. The most expensive individual item lost in the sinking was H. Bjornstrom-Steffanson's four-foot-by-eight-foot oil painting La Circasienne Au Bain by Blondel, valued by him at $100,000. Although the Schedule A claims filed by family members for loss of life did not include first-hand accounts of the accident, they document tragic losses. Finnish immigrant John Panula was preparing for a reunion with his family in Pennsylvania when his wife and four children died on the Titanic. The claims for losses reveal class differences. The loss of life claims reveal the variety of values that could be assigned to a human life. While Alfonso Meo's widow, Emily J. Innes-Meo, asked for only £300 (approximately $1,500 at the time), Irene Wallach Harris, the widow of Broadway producer and theater owner Henry B. Harris, sought $1 million in her claim. Some of the documents filled by claimants state the ages and annual salaries of the deceased to justify the amounts they were seeking in their claims. In addition, they faulted the White Star Line for not properly training the crew for evacuation, leading to the launching of partially filled lifeboats and the loss of even more lives. For these reasons, combined with the fact that the managing director of the White Star Line, J. Bruce Ismay, was on board the Titanic, claimants asserted that the liability should be unlimited. The case made it way to the U.S. District Court for the Southern District of New York in June 1915 after the Supreme Court decided in favor of the British owners of White Star, finding that the laws of the United States, not Great Britain, should be applied to claims of losses from the Titanic sinking. In December 1915, an out of court settlement was reached for the total payout of $665,000 to all claimants. Since this was an out-of-court settlement there is no public record of how the money was divided. Newspaper accounts at the time vary on how the money was distributed. A final decree, signed by Judge Julius M. Mayer in July 1916, held the company guiltless of any privity and knowledge and not liable for any loss, damage, injury, destruction, or fatalities. Emily Ryerson (August 10, 1863 - December 28, 1939) was a first-class passenger who survived the sinking of the RMS Titanic. 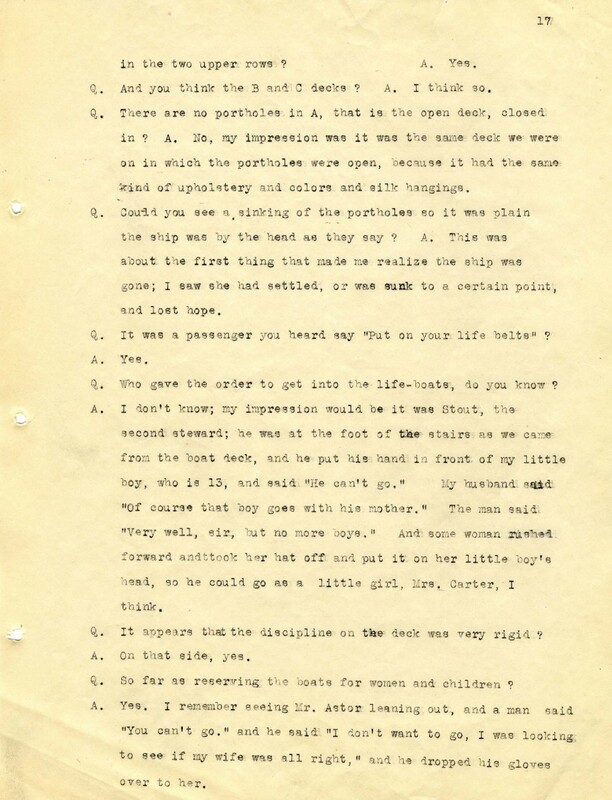 In her deposition she talks about her experience in getting off the Titanic: "...Stout, the second steward; he was at the foot of the stairs as we came from the boat deck, and he put his hand in front of my little boy, who is 13, and said 'He can't go.' My husband said 'Of course that boy goes with his mother.' The man said 'Very well, sir, but no more boys.' And some woman rushed forward and took her hat off and put it on her little boy's head, so he could go as a little girl..."
William Turner (October 23, 1856 - June 23, 1933) was the captain of the RMS Lusitania when it was torpedoed and sunk by a German submarine in May 1915. 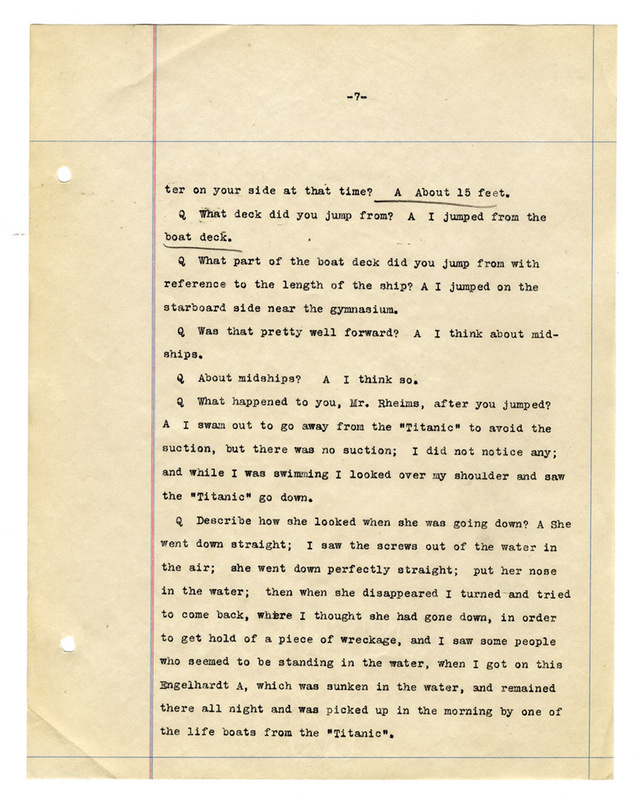 In this extremely unique document the captain of the Lusitania is being interviewed about the Titanic disaster, seven days before the Lusitania will be destroyed. On the day before the Lusitania left on its final voyage, April 30, 1915, Captain Turner was at the New York City offices of Hunt, Hill & Betts. He had been asked to testify by lawyers involved in the Titanic limitation of liability case, which was dragging into its third year. He was asked a series of questions about the size and design of ships on the Cunard Line, the difficulty of sighting icebergs, and his reaction to iceberg warnings. 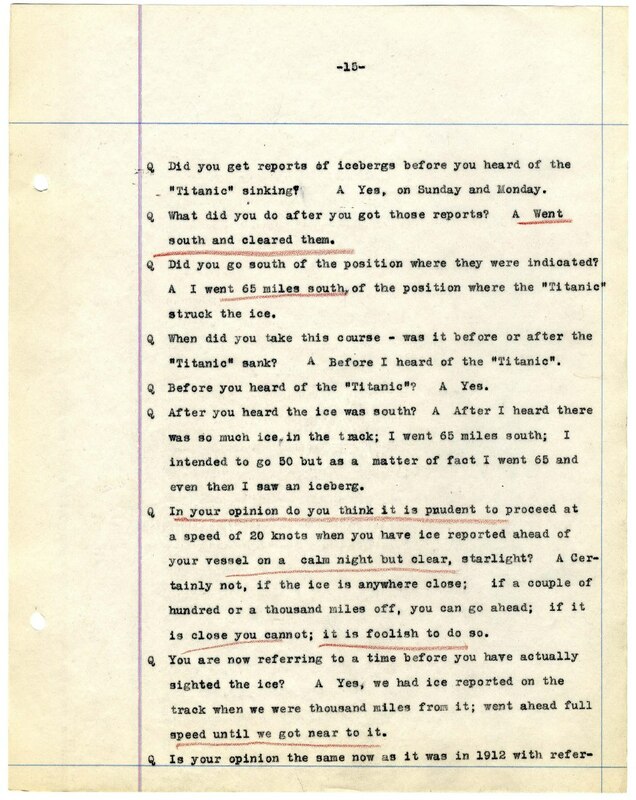 These questions were important because the ship he was commanding, RMS Mauretania, in April 1912 was sailing only a few days behind the Titanic. Ismay was chairman and managing director of the White Star Line. He came to international attention as the highest-ranking White Star official among the 712 survivors. In June 1914, White Star Line's Ismay was questioned about the speed of the Titanic, its lifeboats, the lookouts, and other issues that may have contributed to the disaster. Throughout his testimony, Ismay restated many of the same sentiments given during the April 1912 congressional hearings on the sinking, that all decisions were made by Captain Edward Smith and that he, Ismay, was onboard to consider passenger accommodation improvements for the White Star Line's next ship, the Britannic. Claim of Margaret "Molly" Brown, also known as "The Unsinkable Molly Brown"
The Unsinkable Molly Brown filed a claim for lost property that included an extensive collection of gowns, hats, and jewelry as well as ancient Egyptian models for the Denver Museum. Her list of lost items include: 1 sealskin jacket ($700); 1 necklace ($20,000); 14 hats ($225); 3 dozen gloves ($50) and 2 Japanese kimonos. The total of her claim was $27,887. This socialite was a complete stranger to "packing light." Her claim contains the most pages of any in this collection. Cardeza occupied the most expensive stateroom on the ship and survived the sinking of the Titanic aboard lifeboat 3. Cardeza filed a claim for the lost contents of her 14 trunks, 4 suitcases, and 3 crates of baggage (a total of at least 841 individual items) for a sum of $177,352.75. The itemized claim includes objects such as her 6 7/8-carat pink diamond ring valued at $20,000. In her testimony, passenger Elizabeth Lines recounts overhearing Bruce Ismay remark to Captain Smith on the speed of the ship's crossing, saying that they "will beat the Olympic and get in to New York on Tuesday." This court filling made by Oceanic Steam Navigation Company places the value of passenger losses at $91,805.54.